Veneered high chest of drawers. Attributed to Christopher Townsend or Job Townsend, 1735-1745. Newport, Rhode Island. Chipstone Foundation. Photo courtesy of Gavin Ashworth. Based on my title for this blog post you might expect this to be about music boxes, or perhaps creative studio art pieces that sing when you sit on them, or even some sort of game derived from musical chairs. As interesting as any of those possibilities may sound, I’m going to discuss not an object, but an intriguing practice: that of using music to aide in the viewing and interpretation of furniture. They created a CD or musical tour for which Dr. Elser prepared musical pieces chosen for certain furniture objects in the gallery. Dr. Elser responded based not just on the furniture’s period, but on the way it looked and the feeling it evoked. I recently found this CD, and each music piece helped me concentrate more on the furniture with which it was paired. It opened my eyes to details that I would not have otherwise focused on. The experience is remarkable. I decided to share one pair in this post, and walk through Dr. Elser’s reasons for picking this particular composition. I chose the Newport high chest (pictured above) as this post’s case study. It is one of my favorite pieces in the collection because of its beautiful maple and walnut veneers as well as the interesting geometric inlay on the surface. The high chest was made between 1735 and 1745 in Newport, Rhode Island by either Job or Christopher Townsend. The Townsend brothers are said to have been the patriarchs of Newport’s cabinetmaking trade. They were Quakers who arrived in Rhode Island in 1707. Job probably completed his cabinetmaking apprenticeship in 1720 and Christopher in 1722. As Luke Beckerdite states in his 2000 American Furniture article, “The Early Furniture of Christopher and Job Townsend,” Rhode Island differed from all the other New England colonies from the outset, since in the 17th century it became a center for Quakers fleeing the religious persecutions in England and Massachusetts. 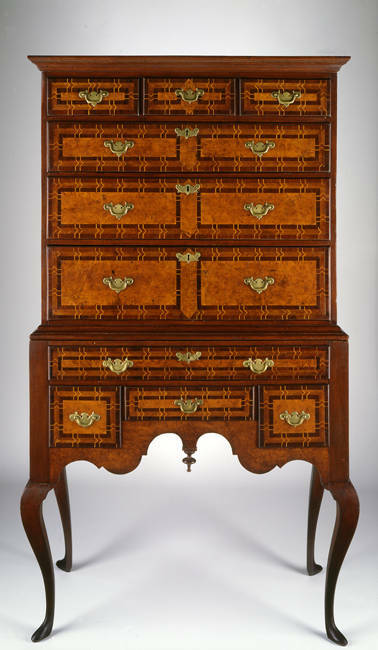 Newport cabinetmakers had a distinctive style that resulted from a desire to mass-produce a marketable commodity. This was the block and shell motif, which consists of a block front with alternating convex and concave shells. Newport furniture from this time period also had glued on legs, as this saved both time and materials. Job and Christopher Townsend were among the makers that in the 1720s developed efficient methods of production, and are associated with the earliest documented Newport furniture. 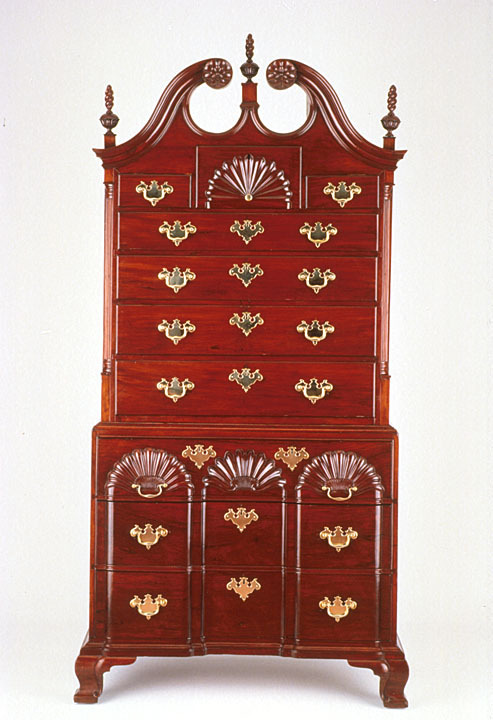 The inlaid high chest at the Milwaukee Art Museum is the only veneered case piece attributed to the 18th century Townsend shop. 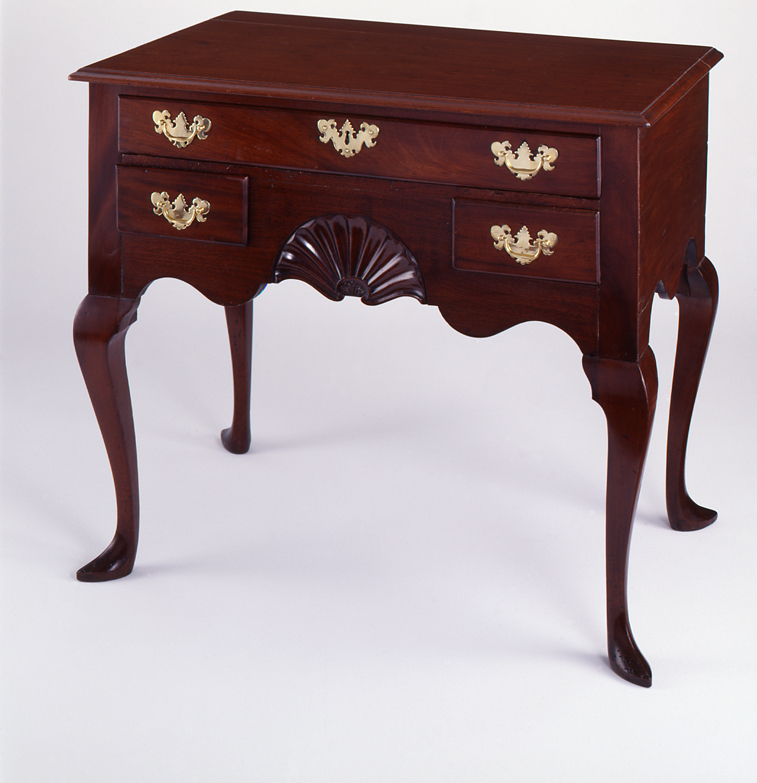 As you can see from the images below of other Newport furniture, it looks completely different from the “typical” Newport style, although the piece’s construction is consistent with Job and Christopher Townsend’s work. Why did they create this? Honestly, we’re not entirely sure. It could be that this was one of their first pieces. It could be that it was commissioned to fit into a room with other veneered pieces. Chest on chest illustrating the block and shell motif. John Goddard, ca. 1765. Rhode Island. Chipstone Foundation. Photo courtesy of Gavin Ashworth. Dressing table. Job Townsend, ca. 1750. Newport, Rhode Island. Chipstone Foundation. Photo Courtesy of Gavin Ashworth. Now, onto the music. Instead of an 18th century classical piece, Dr. Elser matched the high chest with Phillip Glass’s Music in Contrary Motion (which you can listen to here). This might seem like an odd choice at first, but the second that you start listening to the music and looking at the piece, they complement each other. It’s almost as if one was inspired by the other. They are both ornate and experimental. Both are out of the ordinary, and both center around the idea of repetition. The music’s repeating motif appears to be the same, but as you concentrates on the music, it is apparent that there are small variations. In the same way, the inlay appears at first to repeat the same design, but upon closer inspection, there are small variations throughout. Although these variations were probably not on purpose, I find that they make the piece more interesting. The music helped me experience the high chest in a different way. Dr. Elser did not limit himself to the Townsend high chest; he selected musical compositions for several pieces. For example, the Belter sofa that Mel Buchanan wrote about last year, was paired with Liszt’s Impromptu Nocturne because the music’s seductive notes reflect the seductiveness of the plush velvet and over-the-top rococo decoration. What music would you pair with the furniture pieces in the Milwaukee Art Museum’s furniture gallery? Have you ever listened to music in the galleries? This entry was posted in Art, Curatorial and tagged Chipstone Foundation, Christian Elser, Furniture, music and art, musical furniture. Bookmark the permalink. Both Instrument and furniture parts are described in “human terms”…ei.–violins have neck, backs! the wood instruments have inlays, and the wood used is of major import to both! Pegs hold furniture parts and pegs change string instruments tightness. hammers make furniture…hammer. strikes make piano tones! on and on to compare music to furniture. A really fascinating article! It reminds me a little of dancing Disney furniture with the nutcracker suite playing.. These are all great comments. Thank you!